In this video we will show you the basic set-up of our aquaponics system, and introduce you to some tips to build your own. You can visit our website at http://www.experimentsinaquaponics.org for detailed information on all the parts you will need for the build and for maintenance advice, growing tips and fish care. 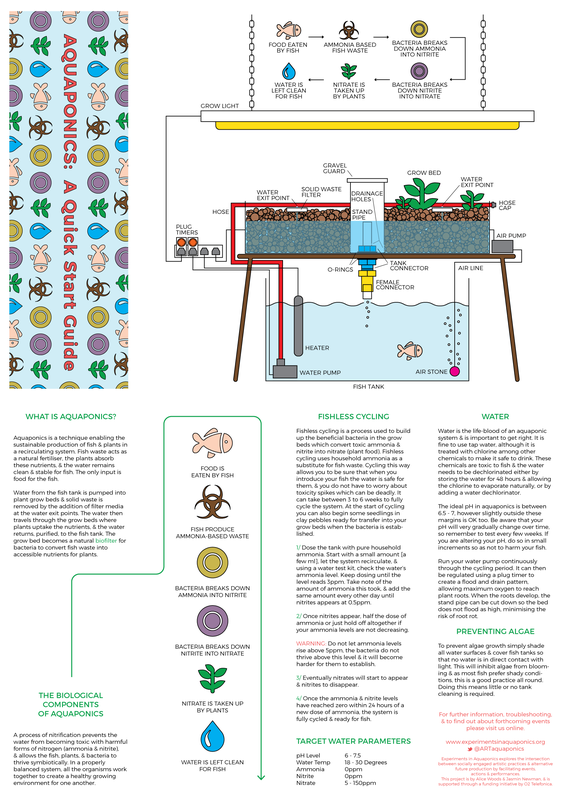 Aquaponics is a system of raising fish and plants in a symbiotic cycle. Fish waste acts as a natural fertiliser, the plants absorb these nutrients, and the water remains clean for the fish. The only input in our systems are food for the fish. No watering (apart from evaporation top-up) or pesticides are required and the process is completely organic. 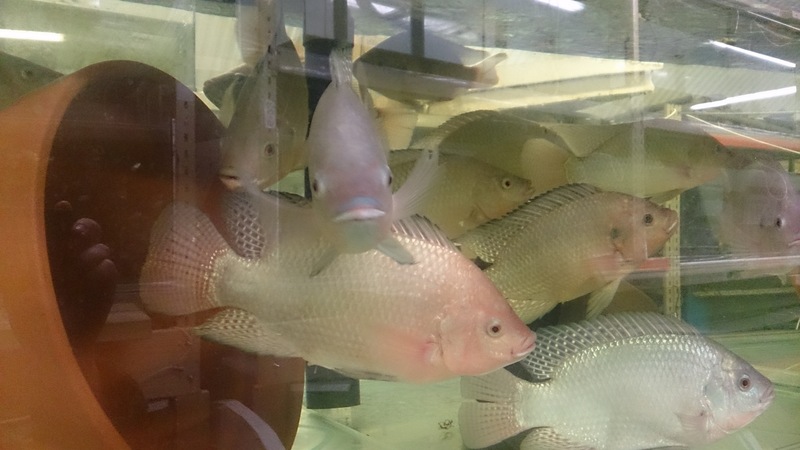 Tilapia were our fish of choice for our larger aquaponic system. Not only do they taste good they are pretty easy to look after and are a hardy fish that can withstand a drop in ideal water parameters. Before keeping them however, there are some important basics to get to know. 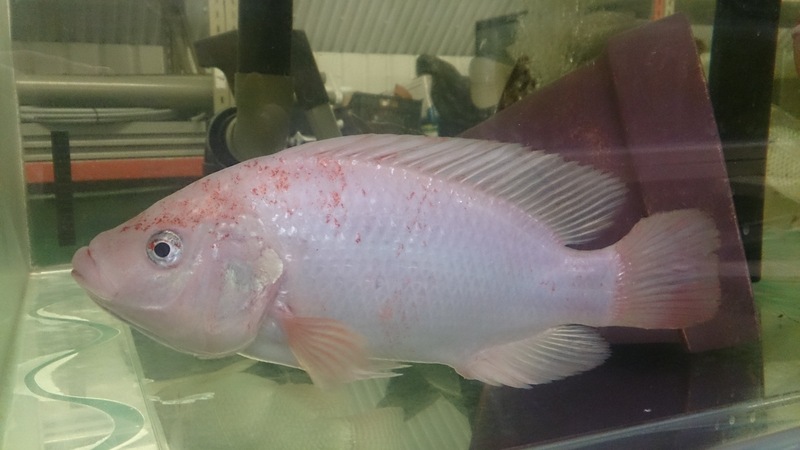 Temperature: Tilapia require heated water, especially here in the UK! 28°C is the ideal temperature and this can be achieved with an ordinary aquarium heater that is the right size for your tank. A few degrees either way probably won’t make much difference but they definitely cannot stand extended periods of colder water. 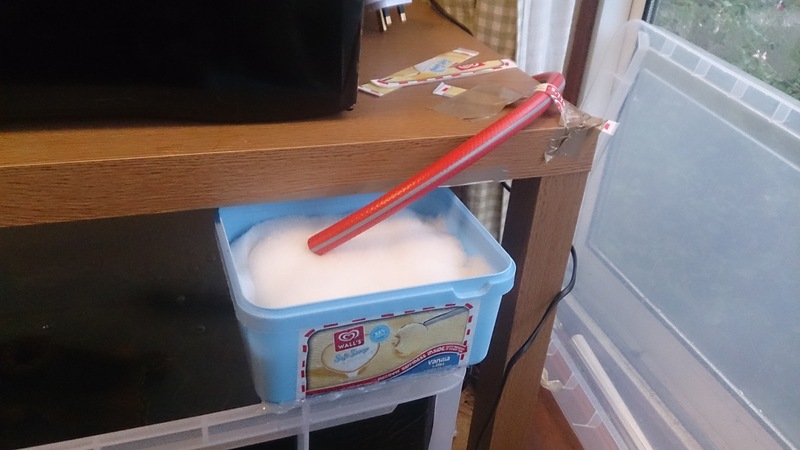 Oxygen: Water dropping from the grow bed into the fish tank will agitate the water surface and allow for an exchange of gases, oxygenating the water. It is a good idea to add an extra air stone incase your system is on a timer and the water goes still for long period of time. If you spot any fish gasping at the surface definitely try adding another air stone. Tilapia also use oxygen to metabolise their food making the need for an air pump even more important. Feeding: It’s always best to get a good quality feed especially made for tilapia. It’s also possible to feed them directly from your system, or incorporate growing something like duckweed that be fed straight to the fish. Tilapia can be mostly vegetarian although in their earlier development they need a lot more protein. Feeding smaller amounts spread throughout the day will be easier on the system and more regular for the fish. We are using an automatic feeder for when we aren’t around to make sure they get their feed. We are feeding 3 to 4 times per day and only what they can eat in a few minutes, if there is food being left by the fish cut back on the food per feeding. Amount of food to be given will change as the tilapia grow, it’s important not to underfeed them! Stocking Density: Without going into specifics of gram per cubic foot, a general answer is one adult tilapia per 10 litres. We have taken this rule as the absolute maximum and have stocked under this amount. Water Parameters: While I mentioned tilapia being a hardy fish this is no excuse to keep slack water parameters! It just means if there is a slip up or a pump stops working there is some leeway to fixing to problem. Ammonia and nitrite should be at 0 ppm to keep the fish in optimum health. Nitrate should be kept under control with regular testing to make sure the plants are doing their job and taking this from the water. Sourcing: Our tilapia have come from Fish Farm UK based in Bow. They deliver to other places in the UK and we highly recommend them. Most sizes are available at a reasonable rate and they care about their fish! A quick online search will provide other suppliers. My home aquaponic system is a very simple one! It is squeezed into the back of the kitchen right next to the back door and is made up of a surprisingly small number of things. 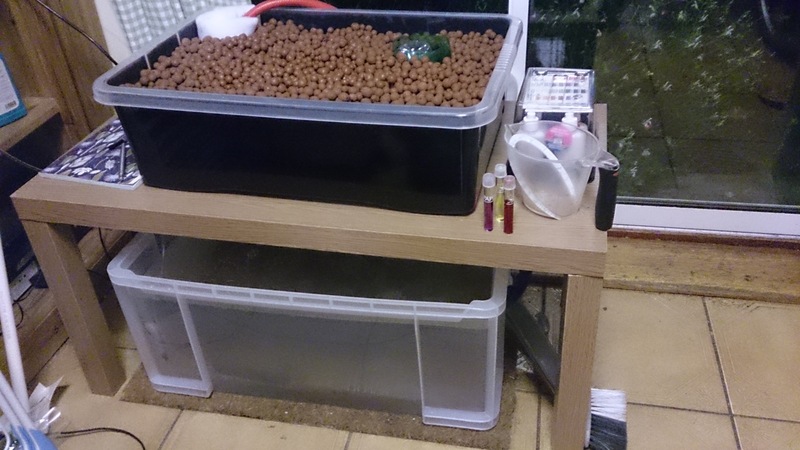 The bottom tank for the fish is a really useful storage box and the grow bed is a shallower storage box that was already around the house. All the plumping bits and fittings were easy to find once I knew what I was looking for. 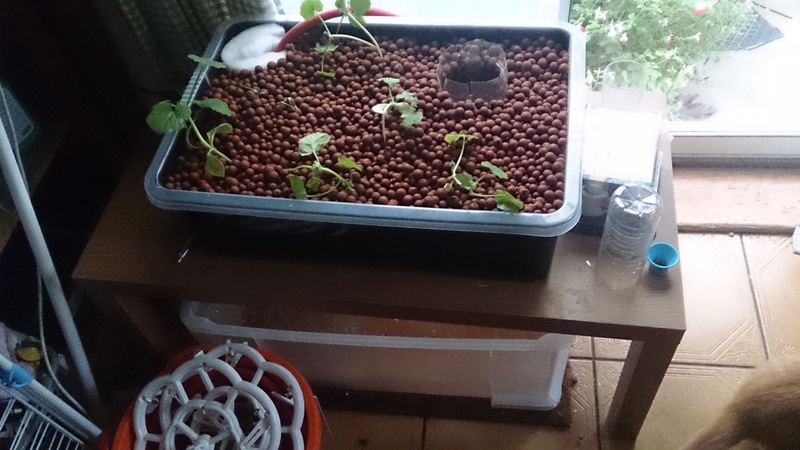 The basic premise for my system was to have the fish tank on the floor under a very cheap coffee table and the grow bed on top of the table directly draining into the tank from the grow bed via a pipe going straight down through a whole drilled into the table. This set up so far is running quite nicely but not without a few hiccups along the way. Like Alice, I started with a bell siphon to automatically drain the grow bed when it flooded but the siphon I had made just wasn’t reliable enough so I went for the pump on a timer method. (More on siphons, pumps, timers and standpipes on a later blog post). I had it going for 15 minutes every hour which was way too much flooding! Due to this and some over eager cats trampling my plants as well as some issues with mould I’ve had to pull out my plants and a have a bit of a rethink and a refresh. This system is so small I’m not sure I’ve got the balance quite right yet. To protect my little fishes since their grow bed filter is no longer running, I’ve got the hose pipe that initially flooded the grow bed going through a DIY sponge filter to keep the bacteria colony I worked so hard to cultivate going and converting ammonia into nitrates (more on the nitrogen cycle at a later date). So far my water levels are all stable. I plan to start some more seedlings and when they are strong enough transplant them into the grow bed to get the system running as it should. I’m very hopeful! This post is a brief overview of my mini home aquaponic system and how it runs on a day-to-day basis. Setting up this home system is a precursor to a larger set-up we are making and a way of learning the principals of aquaponics and how to establish the nitrification cycle in a recirculating aquatic environment. The system is a basic flood and drain model which originally had a bell siphon to automatically drain the bed. However I have since modified it to just a small stand pipe as the roots of my plants have reached the bottom of the bed and now it only needs to flood a small amount. At the moment the pump is on a timer and set to run for 15 minutes, 5 times a day. So far the the system is running successfully but the winter light has meant growth slowed significantly so I have since installed a grow light. I also accidentally overwatered the system with my original bell siphon set up and unfortunately lost the spinach plants. I think this is easy to do given the size of the system and I am hoping it will not be a problem with the larger setup we are building. 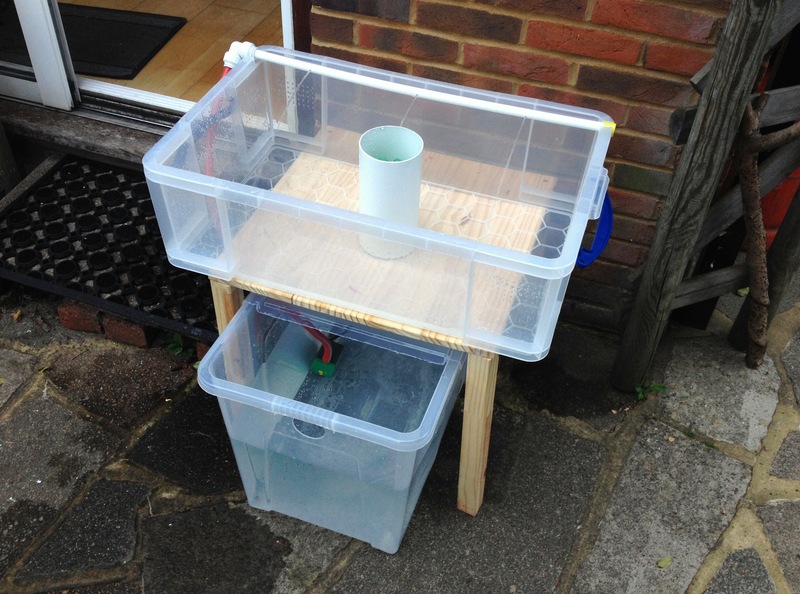 More posts to follow on Jasmin’s home system, and instructions on how to build various parts on the aquaponics system. 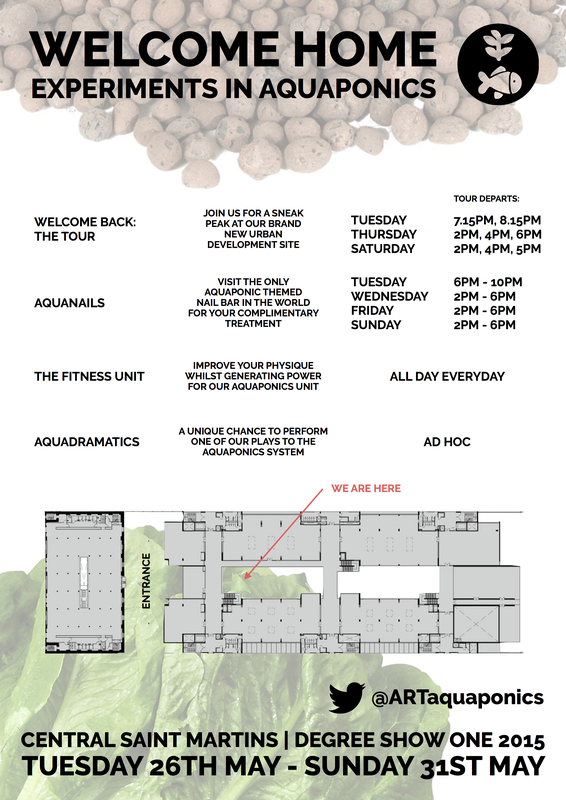 Welcome to Experiments in Aquaponics! On this blog we will be posting thoughts and ‘how-to’ instructions on our home systems, their failures and successes, and updates on the fledgling set-up of a larger system based in Kings Cross where we will be hosting public events and raising Tilapia fish along with a range of vegetables. 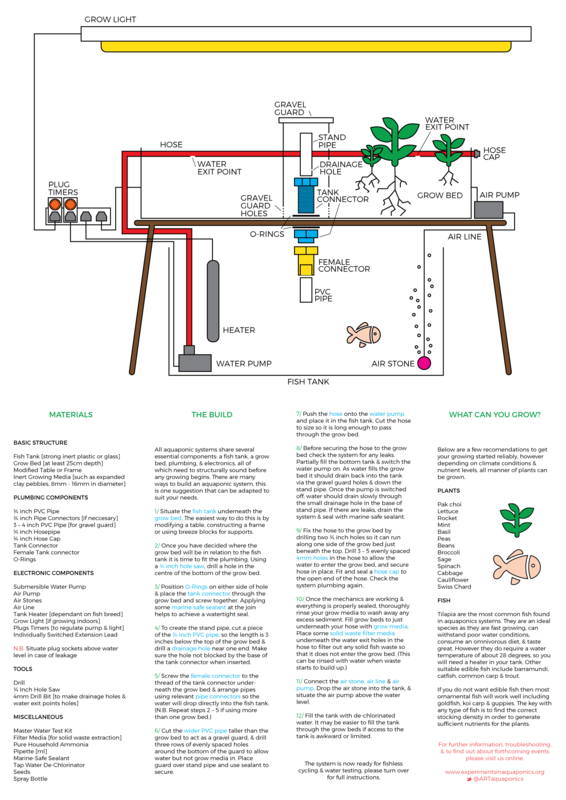 Image: Basic structure of a miniature home system, with bell-siphon and irrigation bar.